Ricky Persky’s head doesn’t reach very much higher than the seat of his pennyfarthing. A smile turns up the corners of his bushy, horseshoe moustache as he steadily mounts his vintage-style bike with a 28-inch wheel in front and a frame that swoops way down and connects a much smaller wheel in back. 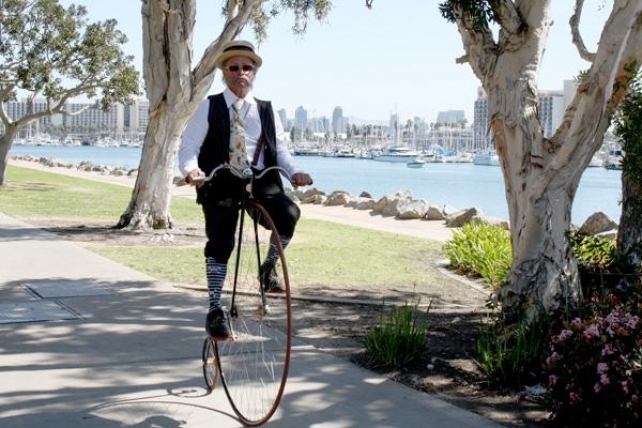 Persky carefully pedals along the sidewalk through Spanish Landing Park dressed in authentic knickers with knee-high, skull-and-crossbones socks pulled taut, a straw boating hat, suspenders, a vintage Winnie the Pooh tie and a vest with the gold chain of a pocket watch dangling out. As he rides through the crowd, everyone turns to look. Small children giggle and point. Couples snap photos. “Look, honey, I’ve never seen one of those in person before” is heard. Some folks even applaud. Persky calls the penny-farthing the original fixed-gear bike. It has only one gear, and the bikes used to be raced on velodrome-like tracks in the late 1800s through the early 1900s (originally, it was thought that the bigger the wheel, the faster the bike). Persky likes the simplicity of the bike’s design. He digs sitting upright and slowing down to two, maybe three miles an hour so he can sit back and relax. “Life opens up when you just slow down a tiny bit,” Persky says. And he means it. It was about 15 years ago, not long after his father’s death, that Persky had an epiphany. He was at his first woodcarving class, really enjoying it, and he thought to himself, Why not try new things more often? Why not do things that make him happy and others smile, no matter how odd? Since then, the longtime San Diegan has built himself a busy and creative lifestyle guided by his every inclination and desire. In 2006, Persky retired from his professional life—first as an ad man for a San Diego handyman company, then as a field biologist for the Department of Agriculture. Along with starting the Penny Farthing Club, he’s allocated most of his free time to his hobbies, volunteer work and offbeat interests. A peek into the cab of his truck, which is covered in white vinyl lettering of quirky quotes he came up with himself or took from someone else, reveals a banjo. Persky’s also apprenticing with a topnotch saddle maker at Downtown Saddlery in Santee, learning the art of leatherworking. Sometimes you can find him hanging out with the swashbuckling crew of Klingons, pirates (or Klingon-pirates) performing sword fighting demonstrations as part of Stranglehold, a local nonprofit that tours California participating in costumed events. Other times, Persky’s pounding away with the Verona Drum and Dance Circle, an activity that helped him earn the Native American “Screaming Eagle” pendant that he feels honored to be wearing around his neck. “I’m being accepted by a number of walks, and it’s really kind of cool,” he says. Last July, the Maritime Museum of San Diego embarked on building a full-sized, functional historical replica of the San Salvador, Juan Rodriguez Cabrillo’s flagship that’s touted as the first European vessel to reach the West Coast. Persky knew he’d fit right in. He signed on as one of the project’s volunteers, and is absolutely pumped that he has the chance to work shoulder-to-shoulder with some of the top wooden-boat builders from around the world. “It’s a once-in-a-lifetime opportunity,” he says as he gives a tour of the construction site at Spanish Landing Park and introduces the workers one-by-one, each meeting Persky’s enthusiasm with a handshake and a chuckle. Persky says he does a bit of everything at the San Salvador build, but his biggest contribution has been coming up with a way to use small wooden scraps left over from the dowels and frame. He’s made friends with the on-site blacksmith, so he puts together the scraps in interesting ways and then has the blacksmith brand the wood sculpture with a line drawing of the ship. He shows off his latest handmade San Salvador keepsakes, which are being sold in the site’s small gift shop, hands me one and says, “Oh, you’re going to love this,” a preface he often uses when discussing the ship, his penny-farthings (he has eight in all) or anything else he’s into at the time. It’s hard not to fall a little in love with whatever Persky’s talking about—his passion is contagious. Persky knows he leads a unique life, but he certainly doesn’t consider himself special. He says anyone, whether they’re in their supposedly quiet twilight years or not, can take advantage of life the way he has. Originally published in San Diego CityBeat on March 14, 2012. Follow Kinsee on Facebook, Twitter or shoot her an email.